Ever since the company was founded in 1910, we have been crafting our canisters with the single goal of providing products that delight our customers. Since when our founder Chuzo Takahashi first started making the canisters by hand, much about the way we craft our product with utmost care to satisfy our customers has remained unchanged. Today, after 109 years, we are still crafting each of our canisters with the same cherished technique that cannot be replicated in mass production, the effect of which is evident in the details. Although our craftsmen and the tools they use may be different after 109 years, our original principles and techniques live on. At Kotodo, we aim, as we always have, to deliver to our customers products that contain more value than their prices. Each time you open our canister, you will experience the pleasant smoothness of the craftsmanship. While the majority of canister manufacturers no longer produce their products by hand, Kotodo has maintained its traditional manufacturing process through its history. Each process has been mastered by generations of craftsmen that continue to be the foundation of our company today. The process begins with cutting out the tin material from a large board. The board is cut into 20 different sizes to accommodate our various tea canisters. 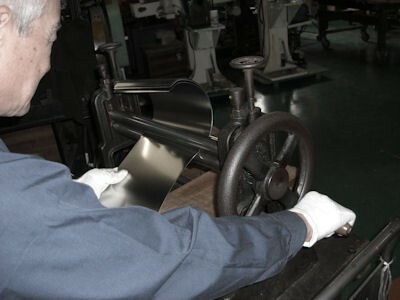 The blades of the cutting machine are hand-adjusted by experienced craftsmen with the gentle touch of a hammer. It is crucial to make sure that the dimensions are accurate to 0.01 mm (0.0004inch), as any inaccuracy will affect the precision of the final product. 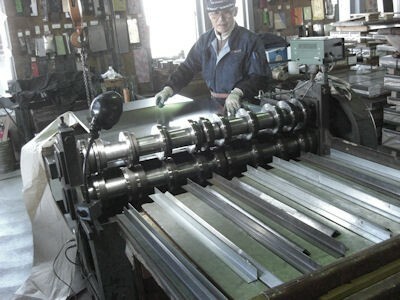 After the tin material is hand-cut, it is then rolled into a cylindrical shape with a special machine. Because this procedure is also carried out by hand, Kotodo tea canisters cannot be made in large quantities. This attention to detail makes our products one of the highest quality tea canisters in the industry. 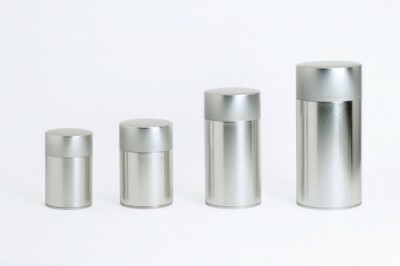 Once the canisters are in a cylindrical shape, they are put into a special mold to define the area that the top lid will sit on. This process is carried out by inserting a rubber balloon into each cylinder and expanding it to ensure that each canister is evenly formed. The rubber balloon's firmness is very volatile and changes with the day's temperature and humidity. It requires the attention of experienced craftsmen to be able to adjust the balloon's air pressure. This process is unique to Kotodo's canisters, and it is the reason we alone are able to produce canisters with a smooth and seamless exterior finish. As an added precaution, the edges of our tin cans are rolled slightly inwards to prevent our users from injuring their fingers. Next, the bottom components are attached to each cylinder completing the overall shaping of our tea canisters. The last step of our manufacturing process is putting a small dent on the inside of the canister and lid so that the lid stops with an audible click. This ensures that the lids of our patterned canisters stop exactly where the patterns match.